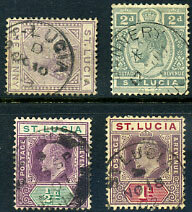 a fully dated range of 173 stamps period AU 30 37 to 5 JU 62. 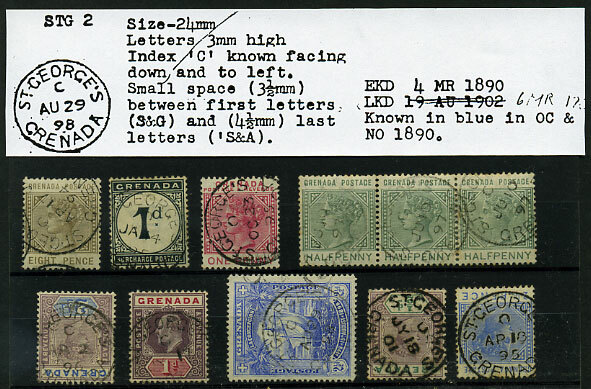 (035.12, narrow B) on QV ½d pair, (035.13, thick bars) on QV ½d, 1d, (035.14, wide B) on QV ½d CC wmk, 1d (thin), 3d, 6d, 1/-, fine condition. 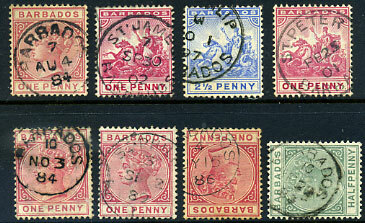 Range QV imperfs with numeral cancels 6, 20, 52(2), 59, 60, 61, 62, 63, 64, 6(8? 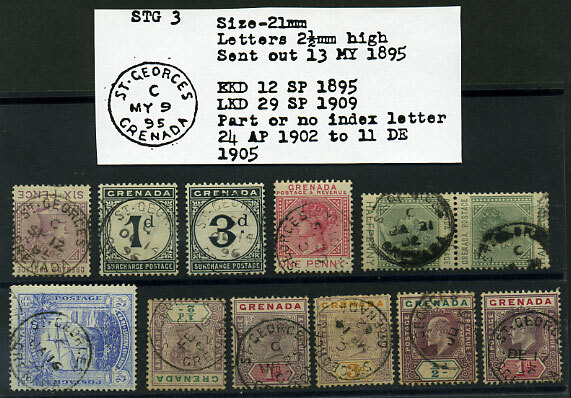 ), 69. No thins, the 11 with inverted 4 wmk. 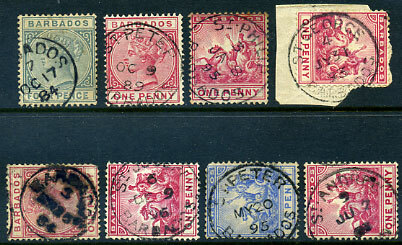 dated range on (1d) comprising AU 6 1873, AU 14 1873, AU 18 1873, AU 21 1873, AU 30 1873, SP 25 1873, AU 2 1875. 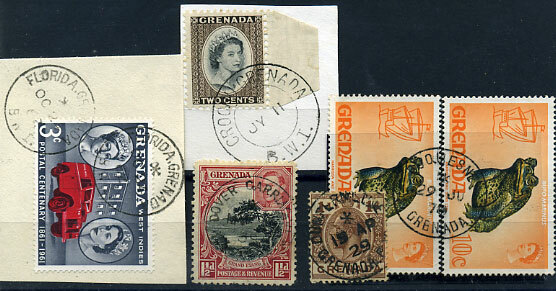 (7 stamps). 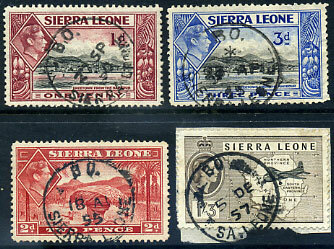 dated range on (1d) comprising MY 6 1881, JU 21 1881, JY 15 1881, AU 3 1881, SP 20 1881, JA 3 1882, JA 7 1882, JA 31 1882, FE 1 1882, FE 22 1882, MR 7 1882. (11 items), minor fault. comprising: Don, George Town, Latrobe, Mathinna, New Norfolk, Railton, Shipwrights Point, Triabunna. (8 items), minor faults. comprising: Harford, Holwell, Huonville, Sandy Bay, Sheffield, Ulverstone, Woodbury, Wynyard. (8 items). 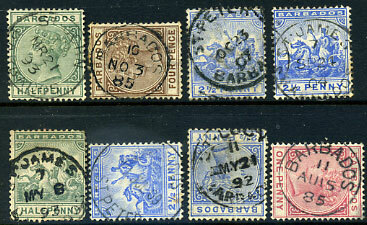 Bagdad, Campania, Campbell Town, Castle Forbes Bay, Chudleigh Junction, Conara, Deloraine, Derby. (8 items), minor fault. 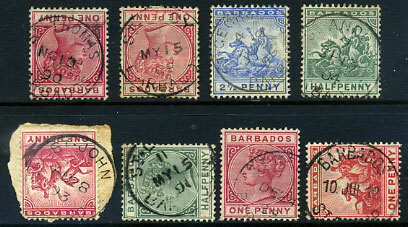 comprising Bellerive, Buckland, Deloraine, East Devonport, Elizabeth Town, Gormanston, Lisle Road Station, Richmond (8 items), fine. 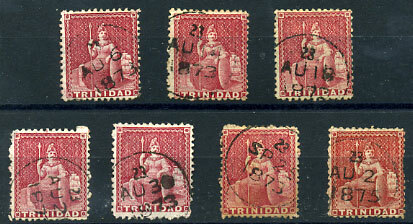 comprising 2, 6, 10, 16, 22, 39, 44, 52, 53, 59, 64, 75. 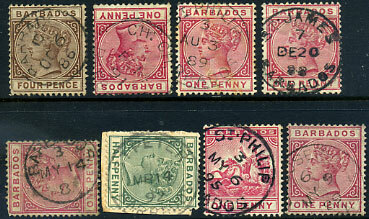 The 64 badly thinned, 39 on 4d and 44 on 2d with inverted wmks, 12 stamps. comprising: Water Street, Freetown, Gandorhun, Hangha, Hastings, Kailahun, Kenema, Koidu Town, Levuma Leppiama, Lumley, Lunghi. (10 items). comprising: Cline Town, Kailahun, Kenema, Kissy, Koidu Town, Lunsar, Magburaka, Makeni, Mano, Moyamba, Pendembu, Waterloo. (12 items). comprising: University College 656 (D2), University College Ibadan (D3), University College B.O. (D4), T. University College (D5), Uyo (D10), Uzuakoli (D2), Vom (D2), Wamba (D4). (8 items), small fault. comprising: Sabongari Zaria (D3), Sapele (D12), Shagamu (D6), Shaki (D5), Tombia (D2), Udi (D7), Umuahia Town (D2), Umuduru (D2). (8 items). comprising: Oguta Town (D3), Ogwashi-Uku 566 S.B. 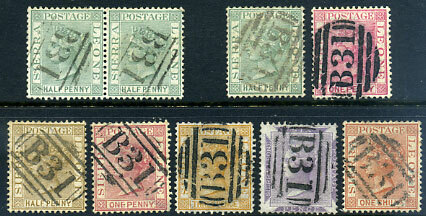 (D3), Oka (D6), Oke Ado (D2), Okemessi (D2), Okitipupa (D4), Okitpupa 569 S.B. (D8), Okpala (D2). (8 items), smaller fault. comprising: Oboro (D2), Obot Idim (D3), Ode Remo (D2), Offa (D5), Ogidi (D3), Ogoni (D2), Oguta (D5), Oguta 565 Savings Bank (D6). (8 items). comprising: Nkwerre (D2), Nnewi (D4), Nsukka (D6), Numan (D3), Nung Odoe (D6), Nwangele (D2), Oba (D2), Obiaruku (D2). (8 items), minor fault. comprising: Gashua (D3), Gboko (D4), Ibi (D7), Ife (D6, no code 25 JU 57), Ifon (D7), Igarra (D4), Igueben (D3), Ihiala (D2). (8 items).